We offer an exclusive collection of Marble Goddess Statue intricately crafted in various themes and position. These are crafted using superior quality white marble. 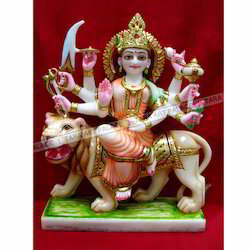 Marble statue of Goddess Durga is one of the most widely revered and most popular of all Indian divinities. Our Statues are dexterously carved by a team of expert designers and artisan, Our statues show the expert craftsmanship of our artisans. Further, our craftsmen make these statues with perfection as feasible for this lord of beginnings. 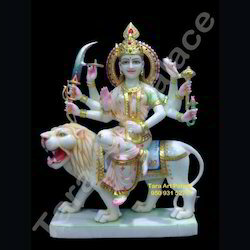 Moreover, our range of Durga mata ji statues is acclaimed worldwide for their qualitative finish and smooth texture. Further, these are available in various sizes and can also be customized as per the demand of the clients. 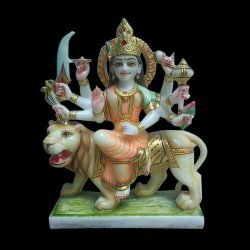 Backed by our team of creative designers and artisans, we are offering an exclusive range of Durga Mata Statues, which is durable in nature and magnificent in appearance. Well-known for its splendid traditional look, the offered statues exhibit a shade of rich heritage of ancient culture of India. This magnificent range of statues can be availed in various sizes and designs and are also available in different customizations as per client specifications. 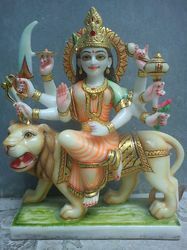 We are engaged in offering an exclusive range of Marble Durga Mata Moorti at market leading prices. The offered moorti is designed with the hard work and dedication of our craftsmen, who put in their best efforts in order to offer flawless range. Moreover, we make this moorti available to clients in varied sizes and shapes and are capable of customizing the range in accordance with the clients’ requirements as well. 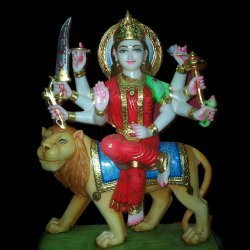 We take pleasure to introduce ourselves as one of the leading organizations, engaged in offering a comprehensive range of Chamunda Mata Moorti. Designed by our skilled craftsmen, this assortment is crafted using optimum quality wood and advanced technology. Well-known among the clients for its attributes like perfect finish, captivating design and smooth edges, this moorti is in compliance with the industry quality standards. Available in distinct forms, the offered moorti can be availed by our clients at market leading prices. 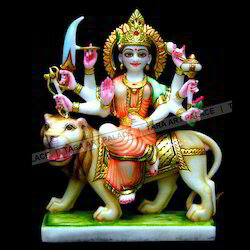 Clients can easily avail from us a striking range of Marble Durga Mata Murti that is brilliant in its design, texture and finish. The offered murti is elegantly crafted by our skilled artisans and craftsmen from the finest grade wood in accordance with latest market trend. In order to ensure unmatched quality, it is also tested on several parameters of design, shine and finish. 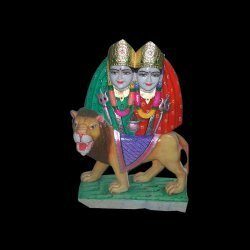 Additionally, this murti is available in both standard as well as customized form at economical prices. 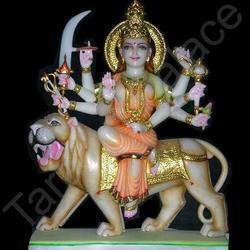 We offer a captivating idol of Durga Statue Sitting On Lion, which is worshiped as the symbol of power and strength. 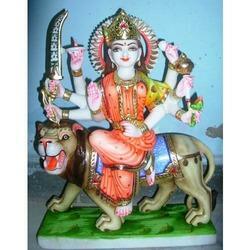 This deity is skillfully carved with premium quality marble and is painted in vibrant colors. 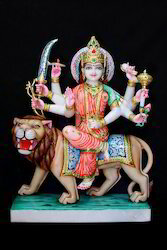 The sculpture has goddess Durga, sitting on a _tiger with her hand in the posture of blessing. Clients reckon this statue for its intricate design, perfect finish and polished looks. 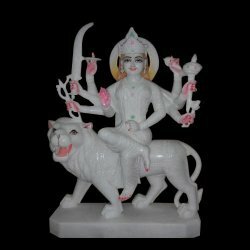 In order to cater to the diverse requirements of esteemed clients, we are able to offer a comprehensive range of Marble Goddess Durga. During the manufacture process our supervisor investigates the grade of the products so that we provision unspoilt quality products to our customers. 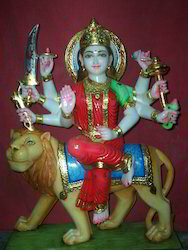 We offer an exclusive collection of Durga Mata Statue intricately crafted in various themes and position. These are crafted using superior quality white marble. 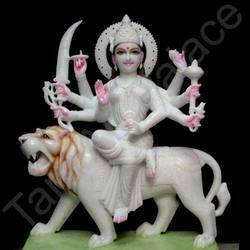 Marble statue of Goddess Durga is one of the most widely revered and most popular of all Indian divinities. 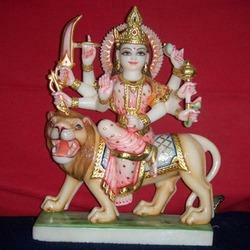 Looking for Marble Goddess Durga Statues ?